Drive-in, drive-through systems provide maximum storage capacity using the maximum amount of space. It is particularly suited to store very large quantities of homogeneous product. 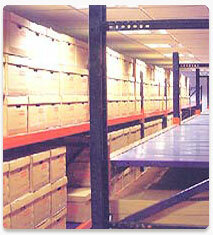 Drive –in and double access systems consist of continuous lanes of racking with only a single load and retrieval aisle. Loading and unloading is undertaken by means of counter balance o reach trucks that drive down each lane into the racks. Drive-in racking operates on the basis first in last out [FILO]. Therefore it only suits product, which is stored in sufficient volume to require multiple lane to ensure stock rotation. When operating Drive-through racking, access aisle are positioned on either face of the Drive block. Drive-through racking, offers the advantage that picking and replenishment can take place independently of each other, allowing first in first out [FIFO] principles to be operated. » Pallet Racking can increase storage capacity by over 100% over the conventional static racks without loss of selectivity. 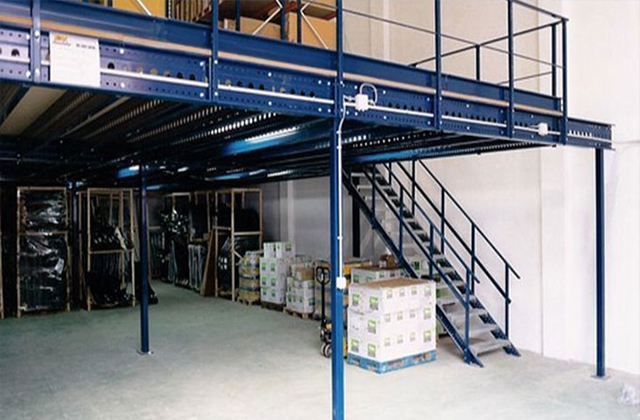 A derivative to the Selective pallet racking, the Double Deep system requires the use of a specialist reach truck or an attachment fitted to reach truck. Whilst achieving increases in capacity of up to 30% above the former, only 50% of the pallets are immediately accessible. This system however provides an excellent method of increasing warehouse capacity or when alternative systems such as the Drive-In which require high numbers of homogenous pallet types, are not possible. » Strong, heavy duty pallet racking system for daily use. » Simple construction with few components. The frames are welded.